Marketing and sales teams should work together to achieve the best results possible. Dave Mossop, Interactive Media Specialist, Expedia CruiseShipCenters, is no stranger to this concept. Mossop’s team handles much of the online marketing for the brick-and-click cruise agency’s 2,500+ sales agents. We published an article today describing the team’s effort to support agents with customized marketing via email, a website, and a customer relationship management system. One interesting tactic we did not mention is the team’s “sell-sheet” emails. Ordinarily, Mossop’s team manage email sent to prospective customers. 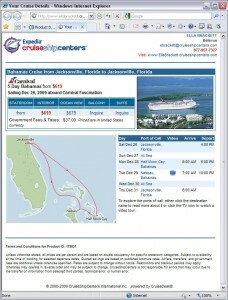 The emails are customized as if they were sent directly from cruise agents to clients. However, agents can identify cruises that individual clients might be interested in and send them a sell-sheet email. These emails are integrated into the CRM system agents use regularly. “With basically one click, type in an email address and they’ll get a copy of what the itinerary is, what the ship looks like, a little about the weather, and it’s personalized with [the agent’s] information as a contact,” Mossop says. You’ll also notice that the emails are customized with the agent’s contact information. They are just one more way that Mossop’s team uses customized messaging and streamlined processes to help agents save time and sell more. You can find out more about how Expedia CruiseShipCenters combines email, social media and mobile marketing at MarketingSherpa’s 2010 Email Marketing Summit in January.